Proof that a trip to Alaska doesn’t have to break the bank . For many people, visiting Alaska sounds like the vacation of a lifetime, in part because traveling there is incredibly expensive. If you're willing to ditch cruising and get creative, though, it is possible to plan a trip that is just as fun but nowhere near as pricey. Anchorage, the state's largest city, is the perfect place to plan a fantastic budget getaway, as there is an unending list of free things to do that will satisfy nature and culture lovers alike. Check out some of the best ones here! 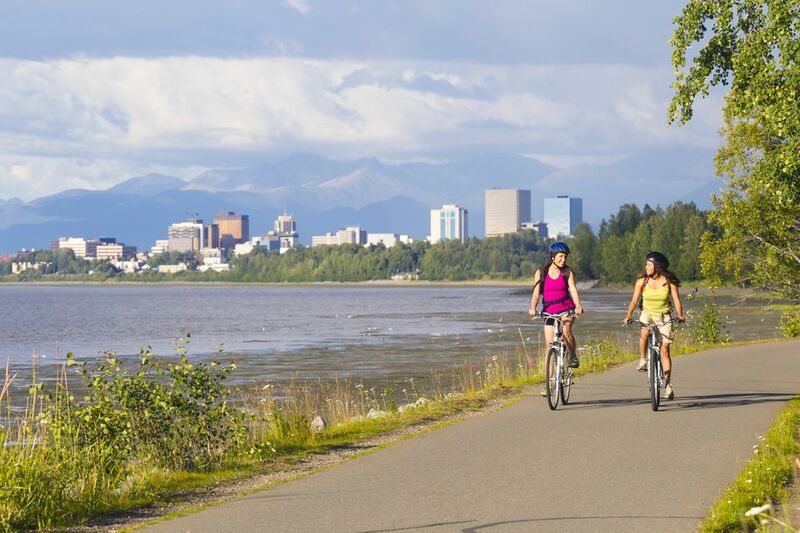 Get an overview of Anchorage without shelling out for a pricey tour by strolling the length of this 11-mile trail, which winds through three of the city’s best-loved parks and offers great views of the Pacific Ocean and the Alaska Range mountains. You’ll also pass by parts of the Anchorage Lightspeed Planet Walk, a scale model of the solar system laid out all over the city, so don’t be surprised if you find Jupiter or Mars blocking your path! While the flat, paved trail is perfect for walking, you can also take a page from the locals and jog or ride a rented bike. When you arrive at this museum, you might think you made a mistake, as it is located inside a Wells Fargo Bank branch. Don’t be fooled by the unusual location, though, as tucked between ATM machines and teller windows is the largest private collection of Alaska Native artifacts in the state. You’ll be able to get up close and personal with costumes, weapons, scrimshaw, and hundreds of other items that provide a window into a culture unique to Alaska. The building’s walls are also covered in murals created by Alaskan painters, including Sydney Laurence, who is often considered the state’s most famous artist. At this park, history and nature collide to create a place like none you’ve ever seen. On March 27, 1964, a 9.2 magnitude earthquake, the second strongest ever recorded, caused massive damage to Anchorage and the surrounding area. Signs posted all over the park explain the event in detail, but you’ll only truly understand the devastation when you look into a canyon filled with trees that fell over 20 feet in a matter of seconds when the ground collapsed from the tectonic movements. While you’re there, make sure you don’t miss the lookout point that provides great views of Mt. Denali, the highest peak in North America, and downtown Anchorage, which looks tiny beneath a wall of towering mountains. This place can best be described as a tourism office on steroids. Sure, it has your standard display of brochures and maps covering all of Alaska, but the real gem is the National Park Rangers who work there, as they are more than happy to advise you one-on-one on the best places for camping, rafting, or whatever else your heart desires. The center also contains interesting exhibits that cover the state’s environment and the people who have lived in it, and plays excellent videos on everything from gold rushes to the 1964 earthquake every few hours. The hardest part of a vacation is often finding souvenirs that are authentic and unique. You won’t have this problem in Anchorage, though, as each weekend a downtown parking lot plays host to the Anchorage Market and Festival, where more than 300 vendors hawk a range of distinctively Alaskan goods, from jade jewelry to birch tree syrup. Reluctant shopping companions will not be disappointed either, as there is a food section filled with vendors selling Alaskan specialties, from salmon tortillas to Russian tea. If you need any more reason to go, live music plays throughout the day. After a few minutes on this mountain, you’ll understand why it is the most-climbed in Alaska. Gorgeous and exotic wilderness and wildlife surround you as you make your way along the 3-mile round-trip hike. While most of the ascent is fairly easy, you’ll get a taste of more extreme mountaineering when you have to scramble on your hands and knees to reach the summit. Once you eventually make it there, you’ll be well rewarded with incredible 360-degree views of Anchorage, the surrounding Chugach State Park, and even Mt. Denali. The word “highway” doesn’t usually bring to mind anything but traffic, long commutes, and squabbling kids. The Seward Highway, though, is much more than a way to get from point A to point B. Stretching 127 miles from Anchorage to Seward, it passes by mountains and glaciers that rise from the sparkling blue water, forests, clear streams, and plenty of Dall sheep and moose. While it provides access to many great towns, you don’t need a destination to take a drive, as within ten minutes of leaving Anchorage you will get a preview of all it has to offer. This cozy mountain hamlet is a favorite vacation spot for locals, and for good reason. Although it is only a 45 minute drive from Anchorage on the Seward Highway, Girdwood feels like a world away, as it is entirely ringed by glaciers sandwiched between towering mountains. Although you can walk through it in about three minutes, it’s worth exploring the quaint downtown. The main attraction, though, is Lower Winner Creek Trail, a manageable 6-mile round-trip hike that ends at a massive gorge, which you cross by wheeling yourself in a hand tram (yes, it is safe). Dangling over raging rapids in a tiny metal cart is an experience you won’t soon forget! If you ever made a list of the most interesting towns you ever visited, Whitter would surely take first place. Chosen as a top-secret base during World War II because of its isolated location, it still feels completely detached from the rest of the world, in part because the only way to get there is though a tunnel blasted out of an entire mountain. (As much as you feel like you're in a different universe, though, it's only an hour drive from Anchorage). The best way to experience this very walkable town is to stroll along the waterfront, where colorful boats bob in the Caribbean-blue waters of the Prince William Sound in the shadow of unbelievably high snowy peaks. Afterwards, take one of the many underground tunnels to Begich Towers, the apartment complex where nearly the entire population resides. After wandering around some of the floors open to visitors, you’ll be grateful that you’re not neighbors with everyone you know!